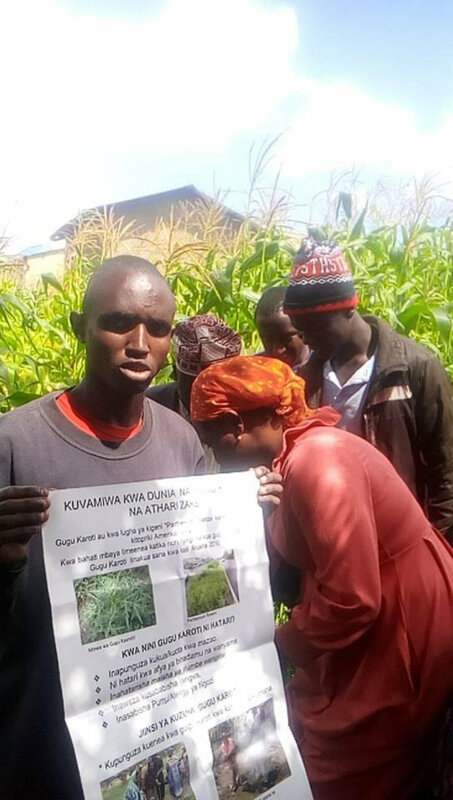 Thadei Lema, a regular guest of ECHO East Africa, is a visually impaired or low vision youth who has been visiting ECHO’s farm to learn more about conservation agriculture for over a month, despite of his eyesight condition. Over the course of knowing him the ECHO staff has been touched by his determination to learn. This month, Thadei and Harold of ECHO were able to reach Arusha Technical College to learn about a guiding cane being constructed by Arusha Technical students and Bio-medical engineer. The cane is constructed to sense obstructions, water, and instable areas while walking. The cane sends a vibration through the handle when approaching a ledge and unsafe areas. The cane is to be issued to Thadei for testing after one week after final modifications are complete. Thadai has also become an inspiration to those helping to educate others about Parthenium hysterophorus. He was taught about the dangers of Parthenium while at ECHO. After being taught about Parthenium, Thadei asked a friend to help reach the area of Morombo in Arusha, an area he has been told which is greatly affected by Parthenium. Thadei has become a great influence to those who know him and those who have heard his story. 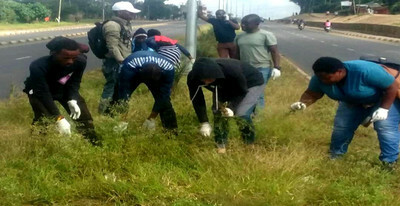 The following days, the Parthenium Awareness team took him to the main road to spend a full morning of uprooting the weed. The committee is thankful for the impacts that the project has had on the community and outreach is continuing to grow. At the end of May, a few members of the Parthenium Committee visited the village of Bwawani where Parthenium reigns the fields. The area is so devastated with the weed that many farms are engulfed with the weed leaving some farms deserted due to extremely poor yields. The committee met with community members who have experienced all of the negative impacts of Parthenium, some not even able to leave home during the day due to a severe allergy caused by Parthenium. The committee is planning an outreach program in the village of Bwawani that will bring sufficient education to the area. The Feed the Future/Peace Corps funded project is coming to an end in July, however the committee sees that many communities yet need sufficient education, and they call for an answer how to overcome the toxic weed. The month of June will be a busy month for the Parthenium Awareness project as the committee is determined for a strong finish and aspires to receive funding for continuing the outreach program within following months.